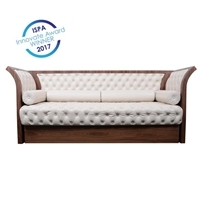 Masquerade Daybed + Massage Table from the Robert Henry Signature Collection by Touch America. 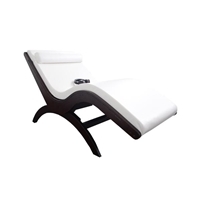 A beautiful and stunning Wave Lounger floats on a pure Avonite frame that will take a client's breath away. LEC Wave loungers feature a sleek, zero gravity design with their renowned Strata memory cushioning system and a wide range of stylish handcrafted hardwood bases to choose from. The sleekly modern Ella Wave™ Lounger will lull your clients into a dreamy reverie with its gentle rocking action. Match your décor perfectly from a broad array of bespoke fabric and laminate options. Simple, yet elegant.. Available in Natursoft Upholstery. Standard in Natural Maple. 31"W x 73"L x 15"H, (at lowest point). CE Mark. ADA Compliant.